Purity, originally uploaded by QuakerVille. 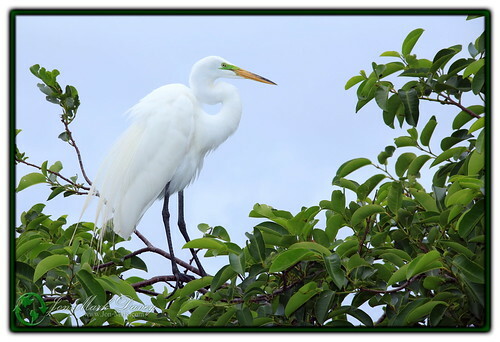 White birds with long white feathers have been admired for hundreds of years. In the mid to late 1800s these beautiful white birds were hunted for their feathers to adorn the ladies’ hats in the North East. These bird feathers were so “in style” that the desire to have these beautiful white feathers almost caused the total extinction of several beautiful bird species. Once numbering in the millions across the southern states their numbers were reduced into the thousands in just a few short years. Historians of the era record phrases like “trees full of white beauty” “air filled with white and pink” “to numerous to even count” as they tell the story of the pre-harvest era. Audubon himself reported that the Everglades was one of the most beautiful places on earth because of the sheer amount of bird life he saw. He was truly inspired by the Everglades and it’s beautiful birds. Before the mid 1800s the Everglades stretched from Lake Kissimmee, just below Orlando and Disney world, all the way to South Bay, the tip of Florida. There were a few thousand people living in that very harsh environment, Seminole Indians and some settlers. Fast forward 150 years and now you will find almost 10 million people inhabiting what was virtually a scary wetland full of big alligators, American Crocodiles, plenty of marsh from ankle to waist depth, and some impressively scary snakes. From a human point of view we’ve had some pretty good success in taming the land, making it livable for us. We have taken once wet and muddy soil and transformed it into wonderful places to live, produce food, and enjoy outdoor entertainment. From a human perspective we’ve succeeded. From the birds and other wildlife point of view they have been decimated. No longer is the sky filled with white and pink and normally green trees aren’t white with roosting avian in the evening. Like John Audubon in the early 1800s many photographers around the world capture pictures like this because we all have this uneasy feeling that in 150 years this is all that will remain of the once beautiful wildlife this planet once enjoyed. We want the future to remember.